Please be advised of a report, from a highly credible source, that person or persons unknown are planning on installing state-of-the-art surveillance equipment in Dominica, which is capable of intercepting telephone, electronic mail, and text messages, used in private communication, both domestic, as well as international. This means that your calls and computer messages may be subject to monitoring, and recording, at any time, and should be considered compromised, and subject to surveillance. Please govern yourselves accordingly. There is no information, at this time, on whether the equipment includes video cameras, but it is recommended that, should you witness any unexplained commercial activity which could be evidence of camera installation on the street, or on buildings, that you photograph it, on your smart phone, if you can do so without any personal risk. 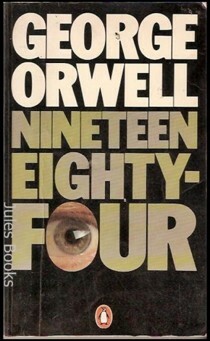 The legality of this surveillance is, of course, a legal issue, and beyond the scope of this article, but it is possible that the work is being performed upon the authority of a court order, or under color of law, and still be later held, by a court of competent jurisdiction, to be illegal. I seriously doubt that it is legal. If you are not familiar with the recent similar proceedings, in the Republic of Panama, the case may provide some clarity, regarding the situation. Ricardo Martinelli, then the President of Panama, purchased a large quantity of surveillance equipment, without proper approval by the National Assembly, and had it installed, and operated, by members of his National Security Council. Opposition figures, their wives and paramours, the Archbishop, and even US Embassy personnel, were subject to intense illegal surveillance, including video recordings, especially in their most intimate personal matters. That surveillance was turned over to Martinelli, who used the tapes as an effective extortion tool, including but not limited to, coercing sexual favors from the wives of Panama's leaders. He has been charged with a number of crimes, as the result of the illegal surveillance, and his extradition has been requested, by Panama, from the United States. 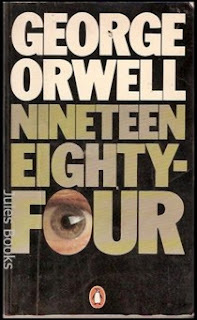 Over 175 individuals were under constant surveillance, for years. Please don't let this happen in Dominica. An unhappy Panamanian government, clearly looking to remove the appropriate, yet incriminating, 'Panama Papers,' from public debate, has successfully caused the EU to remove that title from its investigation. This act demonstrates an effort to whitewash the situation, rather than correct it, and truly reform Panama. In June 2016, Panamanians, acting through the largely figurehead Central American Parliament (Parlacen), requested that the European Parliament asked that the stigma from the research group, convened to examine the extent to which Europeans, using the Mossack Fonseca law firm, had used tax haven corporations to evade taxes, hide the proceeds of corruption, and otherwise break the law, in their home countries. In December, in a note to Panama, the EU agreed, and the investigating committee name was changed to the Committee on Money Laundering, Avoidance and Fiscal Evasion. Panamanians were elated, and openly regarded the change as a success. No meaningful reform has been implemented; the country's internal investigating commission's report was widely regarded, outside Panama, as merely an effort at damage control, for political purposes, and did not propose true reform; its two non-Panamanian members both resigned, indicating that they learned the true purpose of the commission was bogus. Frankly, the purpose of the term 'Panama Papers,' by the world's media, is to remind us of what the ICIJ revealed, and to continue to press for either reform in the tax havens, or to forever label them chronic financial pirates, who are to be avoided by the legitimate financial community. Keep using that name, as it is a highly effective tool, against the existing tax haven culture. According to inside sources, a caller, who stated that he was with the Chambers of the Attorney General of Dominica, Levi Peter, contacted the United States Embassy, in Bridgetown, Barbados, and advised that his office intended to cooperate, with US authorities, in the ongoing investigation, involving Prime Minister Roosevelt Skerrit, and the Iranian nationals, Alireza Monfared, Babak Zanjani, and Reza Zarrab. (1) The Prime Minister; the fact that he is under investigation has now been verified, and he may wish to cooperate. 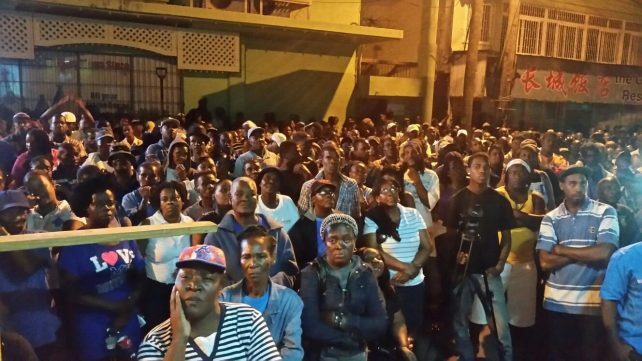 (2) Other senior individuals in the Government of Dominica, who obviously do not want the reputation of their country dragged through the mud, due to a possible criminal indictment of their Head of State. Before you say it cannot happen, it might be well to note that that the United States is not shy about bringing criminal charges against the leaders of Caribbean countries. We remember the cases against former Chief Minister Norman Saunders, of the Turks & Caicos Islands, and General Manuel Noriega. Saunders was arrested when he came to Miami, after pocketing a huge bribe, and Noriega was arrested after Panama was invaded by the US military. It is, of course, possible for the Prime Minister to receive immunity from prosecution, in exchange for his Substantial Assistance, which may involve testimony at trial, in US District Court, in New York. In a plea agreement, however, he might be compelled to disgorge any illicit income that he received, as the result of his role in obtaining a Dominican diplomatic passport for Monfared. The Prime Minister is said to maintain substantial bank accounts outside of Dominica, and he could be required to surrender control of those assets, which we are aware of, and which will be the subject of our next story from Dominica. (1) My fee/commission is USD$80,000 . (2) the cost of the diplomatic passport is $500,000 . (Tell me that this is not a clearly excessive fee). The Minister of Foreign Affairs, by the way has refused to share her list of all the foreign nationals holding Dominican Diplomatic Passports, with the people of Dominica. 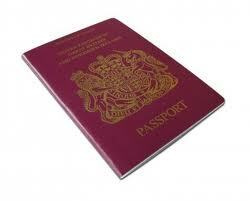 How many more of these bogus passports are going to be sold, and the money diverted, between now and July, I wonder ? Dominicans, is this how you want a government program run ? deficient in anti-money laundering, and countering the financing of terrorism, issues. Readers who wish to review the complete text of this 186-page report may do so here. Media sources in the Republic of Panama have reported that the wife and grown sons of the fugitive former president of Panama, Ricardo Martinelli, have had their visas, permitting entry into the United States, cancelled. The family reportedly attempted to board their private plane, at an airport near Panama city, and were ordered not to attempt to depart for America. They have denied that they sought to leave Panama, for the United States, but sources assert that they did, indeed, seek to exit their country, where Martinelli's sons may soon be facing criminal charges of their own. Ricardo Martinelli has been openly living in Miami for two years; his extradition, to face more than a dozen criminal charges, appears to be in limbo, raising questions about whether the United States Government, or one of its law enforcement agencies, is protecting him from being sent to Panama. The revocation of US Visas could also be a signal that the United States may now be reconsidering Martinelli's extradition. His sons have been named as the recipients of an alleged $6m bribe, paid to them in the Odebrecht construction scandal, and Swiss authorities have stated that they froze multiple bank accounts, believed to be those of the Martinelli family, containing the proceeds of corrupt activities. 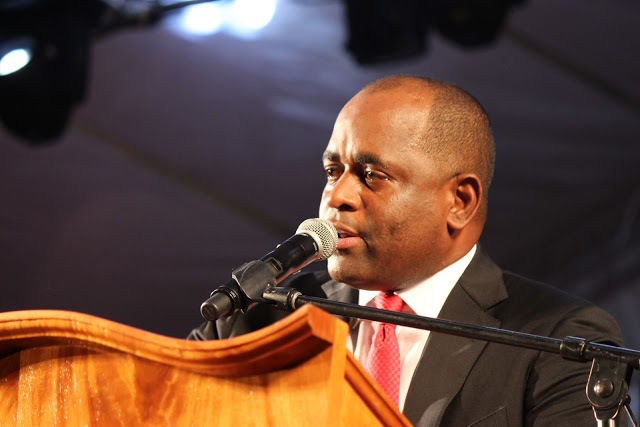 DID DOMINICA PM ROOSEVELT SKERRIT VIOLATE IRAN'S MONEY LAUNDERING LAWS ? With all the chaos surrounding Dominican Prime Minister Roosevelt Skerrit, and the allegation that he is presently under criminal investigation in the United States, regarding his actions in the issuance of Diplomatic Passports, and claims that it is false news, it is noteworthy that a major Caribbean media outlet tonight disclosed that it has its own sources, and that they have independently corroborated that Skerrit is indeed under investigation. It is time to accept the fact that the PM has been verified as a Person of Interest, notwithstanding what he, his dodgy lawyers, and his public relations staff, have released, in the way of spin control. Skerrit should concede the point, or lose whatever credibility he may have left among the people in Dominica. (2) Roosevelt Skerrit found incriminating information in the report, and suppressed it, personally seeing to it that Monfared passed, with flying colors. Perhaps the Minister of Foreign Affairs would like to answer this question, please. 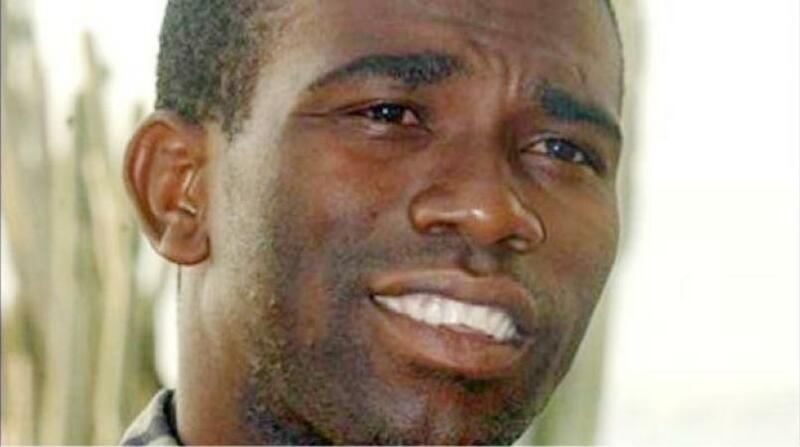 I wonder, which alternative seems more feasible to you, given Skerrit's prior history ? (1) aided and abetted in the movement, in international travel, of the proceeds of crime, to wit: the millions in embezzled Iranian profits, by granting Monfared a diplomatic passport, which allowed him to move wealth, from Malaysia, to Dominica, in "two large suitcases," without having to open them at any Customs or Immigration entry checkpoint, due to the diplomatic status of the passport holder. (2) He accepted funds, on behalf of the Citizenship by Investment program, that were the proceeds of crime, not having verified the Source of Funds. In truth and in fact, the money was embezzled, and was therefore, criminal proceeds. (3) I found several other categories, in the Iranian Money Laundering Law, such assisting the offender, and hiding the true nature of criminal proceeds that could also apply to Skerrit's actions. The expert opinion of an attorney, duly qualified in the Law of Iran, should be secured by interested parties, at the earliest opportunity. Remember well, Skerrit denied the Iranian Government's petition to extradite Monfared, when he resided in Dominica, and moved him to the Dominican Republic, facts will not soon be forgotten by Iran's leaders. Iran will also be interested in any assets left behind by Monfared, if situated in Dominica. We wonder aloud: who will bring money laundering charges against Skerrit first, the United States, or Iran ? Panama's former dictator, General Manuel Noriega, has been released from El Renacer Prison, where he has been serving a 60-years sentence, for multiple crimes including murder, in order that he undergo brain surgery on February 15. Noriega, who served 17 years in a US prison, for drug smuggling & money laundering, and thereafter still more time in France, where he was convicted of money laundering, will be assessed post-procedure, to determine whether he can resume serving his sentence. Panamanian law allows for home confinement for those who are elderly or infirm, and Noriega is 82 years old. At present, Noriega is reportedly staying at his daughter's apartment in a Panama City suburb. The extent of his brain tumor is not known. Money laundering through the purchase and sale of fine art is a field with specific issues, problems and solutions.. The Responsible Art Market has published what is entitled Guidelines on Combatting Money Laundering and Terrorist Financing, designed to inform art dealers, consumers and others in the art market regarding proper AML/CFT policies and procedures, specific to their industry. (1) Knowing and understanding the risks. (2) Conducting a risk assessment of your business. (3) Applying risk-based measures, and the need to be alert to red flags. (4) Know Your Clients, the establishment of risk profiles, and checking for red flags. (5) Researching the artwork, its ownership and provenance, and checking for artwork red flags. (6) Knowing the background and purpose of a transaction, and checking for transactional red flags. (7) The requirement to keep records. (8) Training staff, and monitoring processes and procedures. (9)Knowing how to act, if grounded suspicions exist. (10) Know and comply with local laws where you conduct business. readers who wish to review the complete text of the Guidelines may access it here. Dominica's Citizenship by Investment Program, which confers upon those it accepts visa-free entry, as a member of a Commonwealth of Nations country, is dangerous enough for compliance officers, but its free award of diplomatic passports to dodgy foreign nationals, many from high-risk countries, is just cause to substantially raise Country Risk on Dominica, until such time as it abolishes the legislation permitting non-Dominicans to hold such passports. Dominica's deliberate violations of the Vienna Convention on diplomacy, through issuing such passports, and permitting the holder to reap commercial profit from his status, are unconscionable, and many of the country's citizens have written to me, in agreement. Furthermore, the Ministry of Foreign Affairs is in total denial about the lack of effective due diligence, regarding the Alireza Monfared* scandal. 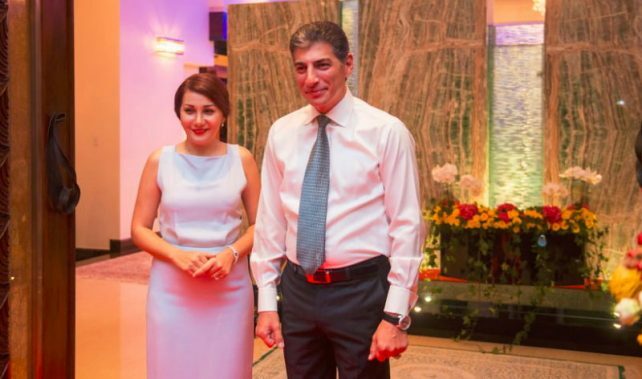 if I knew Monfared was a full participant in a massive Iran sanctions evasion scandal, dealing in tankers full of untouchable Iranian oil, at anchor off Labuan, Malaysia's obscure, yet effective, offshore tax haven, then the Ministry is guilty of gross negligence, or worse, corruption. There was no 'comprehensive due diligence investigation; worthy of the name, using foreign sources, or they would have reported it. In my world, we call that malpractice. 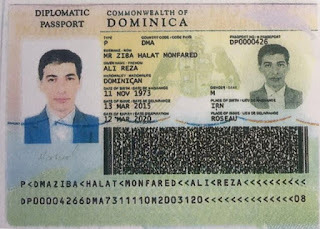 The fact that Monfared routinely used his middle name, Morteza, as a first name, to conduct his illicit trade, and that his actions were not discovered by the Ministry, means that simple database checks, and not a proper field investigation, was conducted. No wonder many of the foreign nationals with Dominican diplomatic passports seem to be running afoul of the law, outside Dominica. The investigations are merely superficial checks. The last straw is the fact that the Ministry has engaged a consultant to assist it, but that his report is not due until June 2017. Does the Minister think that there will be no more Monfareds exposed (and arrested) between now and then ? So long as anyone with a big bag of cash can buy a diplomatic passport from Dominica, I regret to report that ALL Dominican passports presented to bank officers abroad, of any kind or type, are suspect, and Country Risk shall be elevated to a high level. * If we learn, at a later date, that the records of Monfared's Dominican-registered vessel cannot be located, then there will be some serious finger-pointing toward both PM Skerrit, and one of his attorneys, recalling his urgent trip to Greece, to visit the offices of one of his "diplomats." The Board of Governors of the Federal Reserve has published a Cease & Desist Order upon Consent, against BB&T Corporation, for BSA/AML deficiencies. The North Carolina Commissioner of Banks was also a signatory. Readers who wish to read the complete text of the 8-page Order, may access it here. 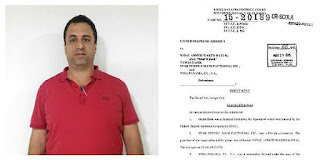 Whether Skerrit will be later be named as a co-conspirator in the Iran sanctions case cannot be determined at this time, but considering the zeal with which the United States Department of Justice is conducting that case, and given the amount of money the Zarrab organization earned, for selling Iranian oil, in violation of international, and American, sanctions, he could face a very, very long prison sentence. 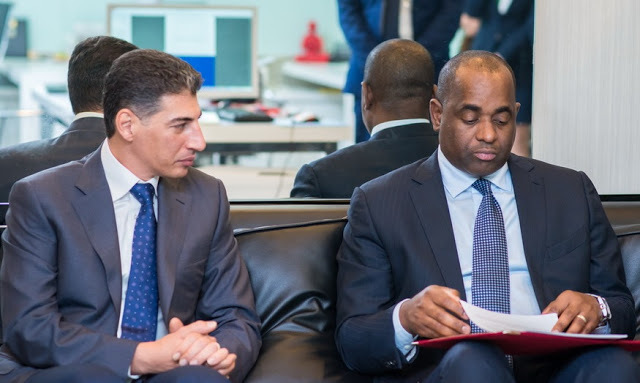 Obviously, Skerrit failed to conduct his own due diligence, or he would have learned that Monfared was operating in very dangerous waters, against the worlds most powerful adversary. Two of Skerrit's attorneys were reportedly deeply involved in the widespread sale of diplomatic passports, but no information is available, at this time, on whether they are a part of this investigation, but due to the fact that they are either going to be co-defendants, or witnesses, they can no longer represent their client, due to a conflict of interest. They may also want to research US law on the Crime or Fraud Exception to the attorney-client privilege. Monfared's illegal activities were common knowledge, in the compliance industry, long before he applied for, and received, a diplomatic Dominican passport, and whether Skerrit exercised undue influence, in the approval and issuance of the passport to Monfared, will most likely be a part of the investigation he and Skerrit reportedly had a close personal relationship, as evidenced by Skerrit's visit to Monfared in Malaysia, where the Iranian national operated what is alleged to be a front company, used to conceal his criminal conduct. Additionally, the award of a diplomatic passport to Monfared violated several provisions of the 1961 Vienna Convention on Diplomatic Relations, and Skerrit's act of issuing the passport, when he knew, or should have known, that it violated an international agreement which Dominica is bound by, increases his culpability. If he is indicted, he will be forced to resign as Prime Minister of Dominica. With Panama reeling from the (unofficial) naming & shaming of seventeen individuals who accepted millions of dollars inillicit bribes from Odebrecht, to approve lucrative government contracts, reliable sources have stated that there are an additional fifteen more Panamanians who will face charges, from the Special Anti-corruption Prosecutor, and the Attorney General of Panama. The 15, who have not yet been publicly identified, will probably be privately warned in advance, to give them an opportunity to escape for the Dominican Republic, which now boasts a true rogues' gallery of wanted Panamanians, many former government officials, including some who recently held positions at the ministerial level. As the level of corruption in the Dom Rep dwarfs even that of Panama, none of those people will be extradited to the Republic anytime soon. The problem faced by the fifteen is that any assets they are forced to leave behind will be seized, at the first opportunity, by the corrupt officials that were not named, and who will take their places by default. Real estate will magically be transferred, through forged documents, and new millionaires will be born overnight. That is what we call business as usual in Panama City. In a bold move obviously designed to avoid any action by the US Department of Justice, the Islamic Republic of Iran has reportedly caused INTERPOL agents to detain one of Reza Zarrab's reputed partners, in the Dominican Republic, and to transport him, in a circuitous route, back to Iran, where he is wanted, for embezzling billions of dollars, during Zarrab & Zanjani's massive Iran sanctions evasion operation. It is doubted whether any of the legal requirements of extradition were observed by Iran, which will most likely be ignored by the Iranian courts, who could impose the death penalty in this case, as they have already done with Babak Morteza Zanjani, a co-defendant. Unless $3bn is returned, Babak will be executed, according to Iranian government statements. 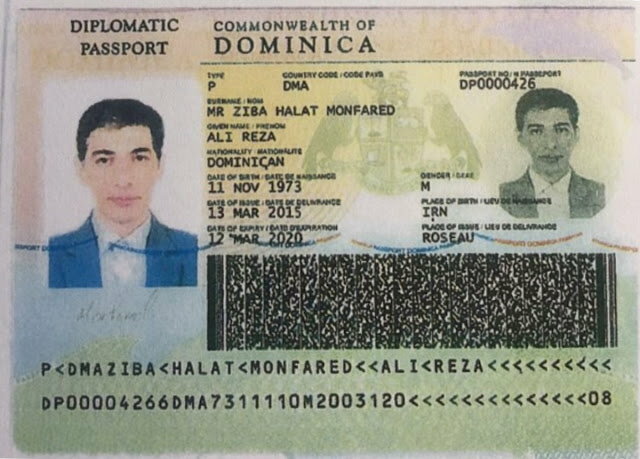 The individual taken is Alireza Zibahalat Monfared, an Iranian national who holds a diplomatic passport from Dominica, which he reportedly purchased for $2m, through a personal relationship the country's Prime Minister, Roosevelt Skerrit, a fact which will certainly reopen the ongoing controversy over dodgy foreigners buying diplomatic status in Dominica, at an obscenely high cost, the proceeds of a portion of which seem to have been diverted from the national treasury, and ended up in the accounts of corrupt officials. There is almost a Cold War feeling to his capture, according to Dom Rep sources; he was transported to Havana (no specific details available), and thereafter to Moscow, which was the favored route of the old Soviet Union before it fell, around 1991. From Russia, he was shipped off to Iran. Monfared had been living a life of luxury in the Dominican Republic prior to his "arrest," the legitimacy of which appear to be in question. So, why the unusual route back to Iran ? Remember that the US arrested Reza Zarrab, when he arrived in Miami, on a planned family vacation to Disney World. It is not only possible that the Department of Justice would want to detain, and question, Monfared, there is a strong possibility that he has a sealed indictment waiting for him, should he pass through or even over, the United States, or any of its territories or possessions. Going through Cuba was an effective way of evading the long arm of American justice, in transporting the fugitive. The fact that Monfared was even captured by Iran has not appeared in mainstream US media may mean that the fact he is not in American custody is an embarrassment for the Department of Justice, given where he was living at the time of his detention. Monfared operated at least part of the time in Malaysia, which has been reported on this blog, as a hotbed of Iran sanctions evasion activity; Iran controls a number of financial institutions in that Southest Asian country, and it is definitely not a friend of the United States, as evidenced by its voting record in the United Nations. It is not known whether the circumstances of Alireza Monfared's Iranian case will have any effect upon the upcoming Reza Zarrab trial, but hopefully, some previously nonpublic details will now leak out from Iran, to give those who wish to learn a more complete picture of the Zarrab/Zanjani illicit oil & gold sanctions evasion operation. Additionally, those who have been extremely critical of the corrupt operation of Caribbean economic passport programs, especially the bogus diplomatic passport aspect, will again call for their abolition, or at the very least, for training a compliance microscope on ALL Caribbean nationals who come from the jurisdictions where citizenship can be bought, no questions asked. The Attorney General of Panama, Kenia Porcell, has suspended the ongoing investigation into criminal conduct at the law firm of Mossack and Fonseca, whose files formed the basis for the infamous Panama Papers, which exposed rampant tax evasion, money laundering, and corrupt activities of hundreds of corrupt government figures, and tax-cheating businessmen, and who allegedly enabled crime on a global scale. Although it has been nearly a year since the scandal broke, Panama has timidly initiated an investigation into the law firm which have given the offshore tax haven industry a permanent black eye, and now attorneys claiming that Mossack Fonseca's Constitutional rights were violated, have forced the suspension of the investigation, until the Supreme Court of Justice can rule on the matter. What on earth were the prosecutors doing all these months ? The answer: taking bribes to slow pedal the case, no doubt about it. Panama's total lack of any legal action against Mossack Fonseca, notwithstanding that their guilt has been established beyond a reasonable doubt, by their own documents and files, is but additional proof of a totally dysfunctional court system, so rotted by corruption, that nothing in the way of true reform will ever be accomplished. If Mossack Fonseca can escape justice in Panama, then the system is completely broken. Will the last honest lawyer leaving Panama, please turn out the lights ? WILL RICARDO MARTINELLI'S SONS, NAMED IN MONEY LAUNDERING CASE IN PANAMA, ESCAPE JUSTICE IN MIAMI ? The Attorney General of Panama, Kenia Porcell, has announced that seventeen individuals, all former government officials and private local businessmen, have been charged with money laundering, in the Odebrecht $59m public corruption case. Ex-President Ricardo Martinelli's two sons, Ricardo Alberto, and Luis Enrique, are among those charged. The question Panamanians are asking is: will the two sons ever see the inside of a Panamanian courtroom ? Reports abound that they received advance notice of the charges, and fled Spain, where they were residing, for Miami, where their fugitive father has lived openly since January 2015. 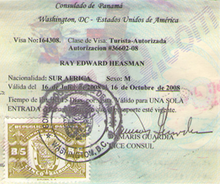 The former president of Panama has not been extradited, and most experienced observers of the Miami scene believe that he must be under the protection of an unnamed US law enforcement agency, or a certain intelligence service, because the US State Department has neither extradited him, nor explained why no court proceedings have been initiated, on the Panamanian warrant, which has been in washington since September. The Department of Justice has a dark history, when it comes to matters that it classifies as National Security, such as the total lack of prosecutions, in the Bank of Credit and Commerce International (BCCI) case. Is it stonewalling the Martinelli extradition ? Was Ricardo Martinelli a confidential informant while serving as president of Panama ? We recall that Manuel Noriega maintained a long relationship with the CIA, while serving as a senior military officer, and wonder how Martinelli, known to have received millions of dollars in bribes and kickbacks while president, was able to enter & live in the US, unless he was assisting an American agency, in some capacity. Does he have immunity from prosecution in the United States, and will he, and his sons, follow in the tradition of former corrupt Latin American leaders, and live out their lives in the lap of luxury, in Miami ? Where's the justice in that ? For those who have been following R Allen Stanford's post conviction quest to overturn what is effectively a life sentence, for operating his Antigua-based Stanford International Bank, a massive Ponzi scheme that stole the life savings from many victims in the United States, and elsewhere, be advised that his final legal effort, to have his case heard by the US Supreme Court*, has ended in failure, as the Court declined to hear his case. The United States Supreme Court denied his Petition for a Writ of Certiorari on November 28, 2016, but Stanford filed a subsequent Petition for Rehearing on December 23rd. The high court denied Rehearing on January 23, 2017. Stanford's only available legal remedies left, now that he has exhausted all his right of appeal, and right to petition for certiorari, are post-conviction prisoner petitions, which are discretionary with the court, and generally have a very small chance of success. Stanford, who is 66 years old, is scheduled to be released from Federal Prison, on April 17, 2105, 88 years from now, when he will be 154 years old. * Stanford vs. United States, Case No. : 15-1490 ( S.Ct.). For those individuals who are always wondering why nobody ever gets charged with money laundering in the Republic of Panama, notwithstanding that the country is a hornets' nest of narco-cash, the proceeds of Venezuelan government officials' corruption, criminal profits of sanctioned Middle Eastern terrorist organizations, and garden-variety tax evasion, the answer is simple; all the reports submitted of local law enforcement, whether by whistleblowers, American law enforcement agencies, or foreign businessmen, are all, upon arrival, forwarded to the criminal syndicate leaders, who then pay a sizable bribe to the government official, for his trouble. Thereafter, things get ugly, if the reporter or informant is a civilian; he or she may find themselves shortly the target of a drive-by assassination, and they are executed, while enjoying a drink at an outdoor cafe. Others might subsequently receive death threats, and wisely exit the country forthwith. in Any event, witnesses will not be available to corroborate the information about money laundering activity, and the result is that the investigation is closed, almost as fast as it can be opened. In truth and in fact, the only investigation that is opened, and stays open, is an improper investigation into the whistleblower or informant himself, conducted by the Organized Crime Division, of the Attorney General's Office, to intimidate the whistleblower. We have previously detailed the incestuous arrangement, which existed, for years, between the criminal syndicates, and the then-chief of the Division José Ayú Prado, who took the incriminating information to such groups as the Waked organization, and other of the country's organized crime families, many of whom are ethnically of Middle Eastern origin, (especially Syria), and was paid handsomely for his betrayal of the oath to seek justice, that he swore, when he became the chief of the Organized Crime Division. That will give you some insight into why nobody goes to prison for money laundering in Panama. DID GOVERNMENT OFFICIALS BRIBE EU MEMBERS TO TAKE PANAMA OUT OF THE BLACKLIST ? The European Union urgently needs to investigate the persistent rumor churning around Panama City, alleging that several members of the European Parliament received illegal compensation, to influence the other MEPs to act to remove Panama from the EU Blacklist of jurisdictions that facilitate money laundering and terrorist financing. Factions within the European Parliament recently called for the tax havens to be included in the 2017 EU Blacklist, and again the stories are being told about bribes allegedly paid to MEPs last year. These are serious charges to be sure, and though no factual basis has yet been shown to support them, prudence demands that they be fully investigated, to ascertain whether they are true. Did any Members of the European parliament show windfall income last year, or make major purchases ? On the Panama side, if it turns out that the allegations are supported by fact, which Panamanian government officials participated in the payoffs ? Corruption may be rampant in the Republic of Panama, but it certainly is not prevalent in the countries of the European Union. We hope that a full, and complete, investigation will be initiated, to settle the matter, for once and for all. 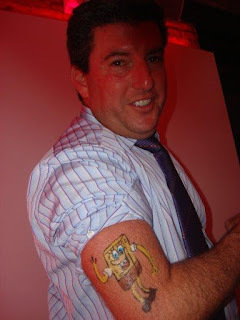 WERE THE SHORT SENTENCES METED OUT TO LAWYERS IN SCOTT ROTHSTEIN'S PONZI LAW FIRM INADEQUATE ? A number of the defendants who pled guilty in Scott Rothstein's billion dollar Ponzi scheme, which was run out of his law firm, and in which several of the defendants were lawyers, and some even partners there, received short prison sentences in their Federal criminal cases. While all those guilty pleas saved the government millions in costs, one wonder whether justice was truly served, and whether the short sentences truly served as a deterrent to others. A number of the defendant are attorneys, and if the truth be told, their law firm created bogus out-of-court settlement agreements, non-existent court cases, and even forged signature of judges, all to fool the victims. I wonder why the trial judge allowed individuals who took their specialized knowledge of court procedures, and perpetrated a massive fraud upon the courts, whose phantom cases they manufactured, for the purposes of fraud, to endure only brief stays in minimum security facilities, only to be released after a few years in not uncomfortable quarters. These people played their victims, using what the victims believed were legitimate settlements documents, to deceive and defraud them into making large "investments". These now-disbarred attorneys, having completed their milds sentences, and soon, their Supervised Release periods, will now be applying to the Florida Bar, to be readmitted to the practice of law. is this wise " These individuals participated in what must be the largest law firm centric Ponzi scheme in American history. What's wrong with this picture ? The French money laundering trial of Teodorin Obiang Nguema, the Vice President of Equatorial Guinea, and the son of the country's sitting president, was suspended after two days, and has been postponed until June 19, 2017. Obiang, who is being tried in Absentia, was given only three weeks' notice of his trial date, and his French attorneys argued that it was insufficient time for trial preparation. The defendant, who was charged with laundering embezzled public funds, owns substantial assets in France, all of which have reportedly been seized by French authorities. He faces a maximum sentence of ten years' imprisonment, and a fine. Who says money launderers operating in the United States have abandoned bulk cash smuggling as their preferred means of transport ? The Port Authority Police Department this week stopped a white SUV for a traffic infraction, on the New Jersey side of the George Washington Bridge., and seized $498,800 in cash from the vehicle. The driver, who was listed as being from Philadelphia, has been charged with Money Laundering. Just when we think the reported misconduct of Leon Frazer & Associates, Inc., in the Cayman Gang of Four case* can't get any worse, regarding the missing millions in the Cayman Gang of Four case, newly-discovered evidence confirms that it was even more egregious than previously believed. Now, we can see that two of Leon Frazer's most senior directors actually lied to a major client, to his face, in order to remove his substantial assets, and move them offshore, to a shell bank that was insolvent, and which would reward the two of them richly, for their larceny. William Tynkaluk, then the Chairman of the Board, notified the client that the TD Bank subsidiary, where the client's assets under LF management were held, notified him, and then-Managing Director Lyle Stein, that all his TD accounts would be closed. The purported reason was the client's investment in a money service business in Panama, and Tynkaluk promised that he would deliver that letter to him. Although no letter was ever produced, Leon Frazer immediately, transferred all the client's funds, and assets, to Cayman Islands-based Dundee Merchant Bank, which was a wholly-owned subsidiary of Canada's Dundee Corporation, whose own chairman had been publicly quoted as declaring that, due to competition, the bank was in serious difficulty. The truth was much worse; the bank was reportedly insolvent, and was desperate need of funds. We wonder how much in the way of "financial incentives" Tynkaluk and Stein received to accomplish this fraud. Dundee never returned to solvency, and later mysteriously closed, without any liquidation proceedings being held, to determine where its remaining assets went. The local regulator, the Cayman Islands Monetary Association (CIMA), never ordered it to liquidate, most likely because of the scandal that its huge losses would generate, and the resultant loss of confidence in the Cayman Islands as a financial center. The rest is history; the client lost an estimated $13m, which has never been recovered, attributed to the financial criminals who compose the Cayman Gang of Four, ex- Dundee officer Sharon Lexa Lamb, ex-Dundee officer Derek Buntain, stock trader Ryan Bateman, and Leon Frazer Director, William Tynkaluk. Back to the story: in truth and fact, the real reason TD closed the client's accounts is that Leon Frazer failed to file annual corporate tax returns for the client, which was its responsibility as a fiduciary, and to deliver copies to TD. There was NO Panama issue, just a ploy, set up by William Tynkaluk, and Lyle Stein, to be able to divert the client's assets to Dundee, which was in financial trouble. I have seen the letter from Dundee, and it makes no such claim. The truth is TD did not receive tax returns, and therefore, closed the client's five accounts, as a compliance action. Should Wiliam Buntain and Lyle Stein be charged, convicted, and imprisoned for their actions, and what about their company, Leon Frazer & Associates, Inc. ? *Willaud Corporation et al vs. Leon Frazer & Associates, Inc., Superior Court of Ontario. Nidal Ahmed Waked Hatum, accused of operating a global money laundering enterprise that cleaned Colombian and Mexican narcotics profits, was extradited to the United States this week, from Colombia, where he had been detained upon arrival several months ago. Waked's arrest caused a furor in Panama, where his family owns several large businesses, which employ thousands, who feared loss of jobs, and the possible shutdown of a bank, and a major newspaper. Waked was charged, in a previously sealed Federal Indictment issued in the Southern District of Florida in 2015, with two counts of Money Laundering Conspiracy, and Bank Fraud, and there are Forfeiture allegations. He faces a possible maximum sentence of 70 years in Federal Prison, though the unknown amount laundered, which could be in the hundreds of millions. over two decades, could result in a Life Sentence, in a system where there is no parole. The Waked money laundering operation was known to the Government of Panama for at least a decade, but due to the close cooperation, between local law enforcement and the criminal syndicates, no charges were ever brought. In truth and in fact, in 2008, a financial crime analyst turned over his detailed report on the money laundering activities of the Wakeds, and a copy was provided to the office of the Attorney General of Panama. The report was, amazingly enough, turned over to the Wakeds by government organized crime attorney José Ayú Prado Canals, who was then in the Fiscal's office, and who is now the president of the Supreme Court of Justice of Panama. The analyst was identified by Prado, and forced to flee Panama for his own personal safety; Ayú Prado remains in office, notwithstanding multiple allegations of his links to career criminals like the Wakeds. The Waked's legitimate business empire, 68 companies, was allegedly used to launder narco-profits, and for that reason, all the principal businesses have had OFAC sanctions placed against them; some have been issued limited exemption licenses, which permit them to continue to operate, but Panamanians are apprehensive about the future of those companies, which are central to the Panamanian economy, and which include a luxury shopping mall, and duty-free stores at Tocumen International Airport. Some Panamanians, in line with the new anti-American posture seen in public lately, accuse the United States of harming the legitimate economy of the country, through the sanctions surrounding the Waked case. OFAC sanctions re commonly known, in Latin America, as the Clinton List, due to the fact that it began during the administration of US President Bill Clinton. Waked has not yet been arraigned in US District Court in Miami, according to a search of the court docket. HAVE HSBCs MASSIVE IRAN SANCTIONS VIOLATIONS HURT THE GOVERNMENT'S PROSECUTION OF REZA ZARRAB ? It is clear, from any objective review of the District Judge's latest order, in the Zarrab case, that the Court has a real problem with the fact that HSBC made a huge profit, by intentionally evading Iran sanctions, and running a lucrative program that had written policies, which ensured no US bank would tumble to the truth.
" Even where a bank is deceived, a jury cannot infer the defendant [HSBC] attempted to victimize the bank [because] the actual exposure of [the] bank, to losses, is unclear, remote or non-existent " Another quote, " ... if the scheme works, the bank is better off." The Court also quoted from the Statement of Facts, in the HSBC Deferred Prosecution Agreement, about the 'repaid queue," where the bank actually placed cautionary notes in SWIFT messages, including " DO NOT mention our name in NY [emphasis supplied]," and "DO NOT mention Iran [emphasis supplied]," so that American banks would not be tipped off. the fact that the Court cited these statements should not be underestimated. There remains a strong feeling, in the US compliance community, that HSBC received a pass on a criminal indictment that should have been filed. One widely distributed compliance article asked "Why is this bank still in business?" Should HSBC USA have been subject to harsh sanctions ? That question remains unanswered. If the prosecution of Reza Zarrab, allegedly the most prolific Iran sanctions violator, in the history of the sanctions, is harmed in any way, perhaps the new Attorney General should revisit the HSBC case, and the bank's reportedly incomplete and insufficient progress in its reform program. An analytical report on the Republic of Malta, commissioned by a political party in the European Union, has reportedly concluded that the country, by virtue of its laws and practices, should be classified as a tax haven. The white paper, which was written by an accounting professor at Nottingham University Business School, at the request of the Green Party, constitutes clear and convincing evidence that corporations who choose Malta as their domicile are required to pay an extremely small amount of tax on their profits. According to statements made by Green Party MEPs, who have quoted extensively from it, Malta has a declared corporate tax rate of 35%, but dividend and other exceptions pare it down to an effective 5% rate, for corporations, which is far below the tax rates of Western European nations that are members of the European Union. Some intellectual property companies actually enjoy a actual tax rate of zero per cent. This extremely favorable tax rate has cost the nations of EU, where those corporations originally were formed and operated, has reportedly been more than €14bn in lost revenues; this money would have gone to the renewal of infrastructure, payment for social services, retraining of employees, and in many other vital sectors of their budgets. This news comes at a time when Malta, have succeeded on January 1 to the rotating presidency of the EU, is still reeling politically to the fact that two senior Maltese politicians have been named & shamed in the Panama Papers, and have still not accounted for undeclared wealth now linked to them. Additionally, there are many unanswered questions about its controversial economic citizenship program, which is not favored by many in Malta, and in the EU, as it grants participants complete Schengen Zone access, which could facilitate crime and terrorist financing inside Europe. Will the EU committee, now charged with the preparation and publication of a comprehensive tax haven blacklist, actually name Malta, an EU member, to that list ? We cannot say, but if it fails to do so, questions about its accuracy may be asked, by compliance officers outside Europe. The European Union Parliament voted to send back to its executive commission a proposed Blacklist of countries that are at risk of facilitating money laundering or terrorist financing, as its Members stated that the list was too short, and did not include tax havens known to be involved. The vote was reported to be 393 to 67, which resulted in a rejection of the list as drafted by the Parliament, according to the legislative body's website. One prominent Member specifically pointed to the Republic of Panama, publicly remarking that "it is ridiculous that Panama, and other famous havens for dirty money, are still not on the [EU] Commission's Blacklist." This statement was widely reported in Europe, and reflects Members' known position on tax havens. Panama was removed last year, from an earlier version of the Blacklist, after it claimed that it had closed the legal loopholes that facilitated money laundering, but there were persistent rumors that government officials in Panama City had made veiled threats, regarding a possible change in the conditions of visits of EU nationals to Panama, and access of EU-flagged vessels to the Canal, which resulted in the deletion of the country from last year's list. The fact that Panama was specifically named by an MEP, for inclusion in a future draft of the Blacklist, should be taken into account by compliance officers, in updating their assessment of Country Risk on Panama. Panamanians, who appear to be rapidly returning to the Anti-American posture that the country has taken in the twentieth century, are now alleging that the naming of President Varela, and others in his administration, as recipients of Odebrecht bribes, was done with malice, and with the intent to harm the country, harm the image of the president, cause the loss of thousands of jobs, and turn back economic progress. Additionally, they intimate that bribes occur regularly in the United States, and Panama should not be placed in the spotlight, for what is a widespread (albeit illegal) practice. Those individuals with the loudest voices might want to remember that there was NO official naming & shaming of the Panamanian officials taking bribes from Odebrecht; an unofficial list, purported to have come from the "Fiscal" (attorney general) in New York. First of all, the Attorney General in NY is a state official, not the Federal US Attorney, who prosecutes FCPA violations, and US law enforcement does not name criminal defendants when they are not yet in custody, lest they engage in flight to avoid prosecution. There was no malicious naming of President Varela, just a listing of bribe recipients concocted by a zealous anti-corruption civilian, I will wager, and if you want to know the truth about the extent of corruption in the US, look it up on Transparency International. It is nowhere near the levels seen in the Republic of Panama. In my humble opinion, there was no targeting of Panama's president by American authorities. Members of the United States Senate, yesterday interviewing the new Trump Administration nominee for Treasury Secretary, asked the candidate how he intends to close down the Caribbean tax havens, specifically naming the Cayman Islands. The Senators were demanding details on how the new Secretary expects to close the tax loopholes that allow American entities and individuals to use foreign subsidiaries, in zero-tax jurisdictions, to avoid taxable events. 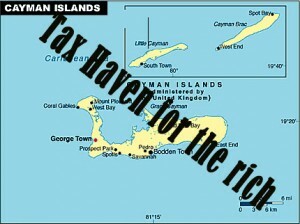 The Senators, in their questioning, focused upon the Cayman Islands, as well as the more obscure tax haven of Anguilla, in showing their displeasure of what they clearly indicated was abuse of American tax laws. We have recently detailed how financial service professionals, working in the Cayman Islands, intentionally use combinations of jurisdictions, like forming a BVI company, owned by a Belize trust, to create a totally opaque, non-transparent vehicle, tax-free, with no identifiable beneficial owner. In the aftermath of the Panama Papers scandal, members of the Senate and the House of Representatives have affirmed the immediate need for effective tax reform, whether through new legislation, or Treasury regulations, to eliminate the present situation; they appear to be looking for the incoming Treasury Secretary for a solution; Political pressure is clearly present on this matter. What will the end of offshore tax advantages for US taxpayers mean, to the Cayman Islands, as well as other Caribbean financial centers that do not impose taxes upon profits ? Will investors, and the hedge fund industry, flee Grand Cayman, completely torpedoing the local economy, and plunging the island into a major depression, requiring financial aid from the UK ? We cannot say, but we will be closely watching Washington in 2017. One wonders whether this might be a good time to sell off all Cayman Islands real estate holdings. The trial judge in the Reza Zarrab Iran sanctions case has sent detailed, written, supplemental questions to counsel for all the parties, in connection with the pending Government motion to disqualify a number of the defense attorneys, due to a claim of conflict of interest. The Court's order also raises peripheral issues, that are outside of the outside of the subject of the motion, and which may indicate its concerns. (3) If defense counsel is able to breach the "Chinese Wall" erected between the bank and defense lawyers at the same law firm, at its election, is there really an ethical wall ? (4) What is the significance here, of the fact that HSBC deliberately and intentionally evaded Iran sanctions, on a grand scale ? (5) What is the significance to these proceedings, of the fact that the Government previously identified HSBC as a victim bank ? Is the Court now truly questioning the legal sufficiency of the case, or is it just throwing these issues out, in order to come to a decision solely on the conflict of interest issue ? Counsel for all the parties must submit their responses by January 25, 2017. Compliance officers all over North America are closely watching the suit brought by FinCEN, against Tom Haider, the former compliance officer at MoneyGram, which seek to enforce a $1m penalty, levied against Mr. Haider, individually. While all parties to litigation have a constitutional right to access to legal counsel of their choosing, in my humble opinion, Haider's counsel, while seeking, in the litigation, to have their client evade responsibility for his alleged compliance malpractice, through a technical argument, denying FinCEN's legal right to impose individual liability for compliance failures, shows that their client believes that only his former MSB is liable, for his intentional torts. This is clearly wrong; compliance officers, like all professionals, are personally liable for their individual malpractice, and trying to pass the buck to their company says that they do not accept responsibility for their actions. One cannot hide behind a corporate shield, especially where one's actions are egregious, repeated, and chronic. That is not what compliance officers are about; we are the trusted gatekeepers for our bank, or NBFI, or MSB, or CU clients, and to seek to avoid the consequences of our mistakes, through technical or procedural means, is not only dishonest, but interferes with the trust established between compliance, and bank leadership, who is depending upon us to protect their entity. If there are no personal consequences for intentional compliance misconduct, then the level of due care a compliance officer takes with his or her work could not only decline, compliance apathy, about quality of work product might ensue, which translates to a substantial raise in operational risk. Keep the bar high, in the compliance field, by supporting good work, and by punishing intentional acts that subject a client to sanctions, monetary damages, or worse. The shape of things to come in Panama tomorrow ? 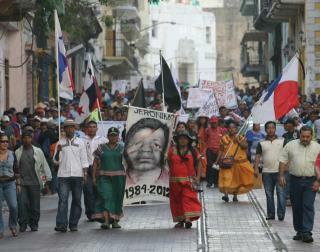 The citizens of Panama City are organizing a major street protest for tomorrow, Friday, to demand that the names of the former government officials, in the previous Martinelli administration, who received part of the $59m, in bribes paid by the multinational construction giant, Odebrecht, to obtain lucrative contracts, to disclosed, and that the guilty parties be prosecuted. For some reason, there has been no public release of the names of the recipients of the illicit payments, some of whom reportedly are private citizens, and were not either in the prior, or present, governments. After an unofficial list was circulated, which asserts that it came from a US law enforcement source, the public calls for naming & shaming, directed to the Government of Panama's anti-corruption prosecutors, who are conducting the investigation, increased. This far, the only former government officials publicly named is the fugitive former leader of Panama, Ricardo Martinelli, who is alleged, with his sons, to have received over $6m, from Odebrecht, some of which appears to be held in accounts, recently frozen by Swiss authorities, who are requesting information, about the account holders, from Panama. The New York State Supreme Court, in a opinion* dated January 5, 2017, has disbarred David J Boden, who was the in-house attorney at Scott Rothstein's law firm. Boden pled guilty to Conspiracy to Commit Wire Fraud. a Federal felony, for which he was sentenced to 18 months of incarceration, and one year of Supervised Release, and he was released in November of 2016. The Court noted that he failed to notify the State of New York of his conviction, which is itself a violation of New York bar rules, I understand, as it is in other jurisdictions. The Court held that Boden's conviction was for a crime that was essentially similar to the state felony of Scheme to Defraud in the First Degree, and also found that he had been automatically disbarred "by operation of law at the time of his conviction. "Boden had asked for a postponement, to permit him to seek an "expungement," through an as yet unfiled motion, but the Court denied his request, and granted the Disciplinary Committee's request for Disbarment. One puzzle remains: what is a lawyer, not admitted to practice in the jurisdiction, doing in a law firm where all the other counsel are lawyers who are admitted ? I have often wondered why he did not simply take the Florida Bar Examination. Otherwise, his utility was limited to office practice, and if everybody else is a lawyer, why have someone not admitted on staff, as counsel ? Who was he advising ? If he was charged with supervising the "investment contracts" that the victims all signed, detailing the bogus legal settlements, and bogus judgments of phantom client, his level of culpability was indeed higher, and his sentence, therefore, was too lenient, in my humble opinion. That being said, he has paid for his crimes, and deserves an opportunity for rehabilitation; let us hope we will not be writing about him in the future. *Matter of Boden, 2017 NY Slip Opinion 0092 (Sup. Ct. App. Div.). The reported $59m settlement, between the Brazilian construction giant, Norberto Odebrecht SA, and the Government of Panama, which Panama asserts is the amount of bribe money paid to land major contracts in Panama, may be lower than the actual amount of bribe and kickback money payments made to Panamanians, according to reliable sources, who claim the true figure is much higher. Many prominent Panamanians, both in and out of government, are said to have each received millions of dollars, to approve major construction contracts with Odebrecht. The fugitive former president of Panama, Ricardo Martinelli, allegedly received over $6m, distributed to him, and his sons. The fact that the payments were so widespread in Panama is extremely disturbing, and further confirms that a culture of corruption, at the highest levels, continues to flourish, uncontrolled, notwithstanding the reputed reform efforts of the present Varela administration. When additional details;, regarding the discovery of new information about additional bribe payments, becomes public, we shall analyze it on this blog. In what can only be regarded as utter arrogance, in the face of what should have been the last gasp of a scoundrel, the king of the Ponzi schemers, R Allen Stanford, whose Stanford International Bank ruined hundreds of lives, has filed a petition for rehearing, upon the US Supreme Court's denial of his Petition for a Writ of Certiorari. You may recall that his original cert petition, to the high court, was denied, without opinion, on November 28, 2016; his District Court conviction was affirmed by the Fifth Circuit, in his only appeal as a matter of right. US Supreme Court proceedings are discretionary with the Court. Stanford, who is seeking to overturn his conviction, and 110-year sentence, lists grounds that most lawyers would decline to assert for fear that they might be disciplined, for arguing issues that have no basis in either fact or law, or are a good faith argument to overturn existing law. Does not the word hubris apply to Stanford in this proceeding ? (1) The pretrial civil seizure of his assets precluded him from retaining the counsel of his choice, in his Federal criminal case, and appointed counsel, who was overburdened, and his defense suffered as a result. (2) Amazingly, Stanford also argued that he would receive true justice from a nine-person Court; cert in his case was denied by the existing eight-person Court. He actually claimed that a future Trump appointee to the Court would insure justice in his case. We trust that the justices of the Supreme Court will swiftly examine the petition, and render the appropriate decision, to add finality our coverage of this massive Ponzi scheme. We continue to hear from investors who sent in money to the broker-dealer, Panama Wall Street, SA, shuttered by order of the Superintendency of Securities (SMV). The victims have been told that the Government of Panama has frozen all the assets of the firm, in the Intervention, though the truth appears to be that the company was a Ponzi scheme, and no significant assets were seized. Securities fraud has been alleged. Panama Wall Street's principal, Joachim Bernard Buse, a citizen of the Netherlands, who previously operated a fictional "High Yield Investment Program (HYIP)," is known to have spent huge sums of investor funds on jewelry, for his Peruvian paramour, and to have made other purchases of expensive personal items. Persons or entities unknown to this blog have attempted to hack into, corrupt, and otherwise interfere with, previous articles about the fraud committed at Panama Wall Street, but all such efforts have been unsuccessful. Readers who wish to review the Intervention Order against Panama Wall Street SA can find it on previous articles published by this blog. The Government of Panama has announced that it will no longer accept visa-free entry of individuals who hold multiple-entry visas from the European Union; they will be required to obtain Panamanian visas prior to their visit. The holders of visas from the UK, the USA and Australia, valid for at least one year, are still allowed visa-free entry. The change is claimed to be an effort to improve immigration controls. Whether this is an effort to exclude individuals from the developing world, who engage in transporting financial instruments into Panamanian banks, for tax evasion or money laundering purposes, is not known. Add this to the recent refusal of Panamanian banks to open new accounts for foreign nationals, which some observers see as a possible response to the Panama Papers scandal, and it could represent a trend, towards the suppression of money laundering activity in the Republic. Some are pointing to the fine assessed, against Odebrecht, as an example of a sea change in Panama's policies. Of course, to be truly effective, Panama will have to actually arrest, try and imprison offenders for money laundering offenses, which is not currently the case in Panama City, where bankers move dirty money with total impunity, working with both foreign money launderers, principally from Venezuela, and Panama's powerful Syrian organized crime syndicate. If you have ever served in the US military in a combat zone, you know what stolen valor is: claiming to have been awarded some of our country's highest awards and decorations, for service in a combat role, when you have not been so designated, with the intent to receive monetary or other tangible benefits as the result. The Stolen Valor Act makes such conduct a Federal crime, and there is nothing more despicable than an individual claiming to have received such an award, when such is untrue, and using that lie for material gain. Unfortunately, this law is limited to military awards for exemplary service; it does not extend to efforts to cash in on purported civilian government service, or affiliation with those who might have distinguished themselves, while engaged in such service. Now, on to our story. Recently, a company in the compliance industry was contacted by a firm that wanted to take advantage of the other firm's banking clients, to obtain assistance in finding a bank sponsor, among the firm's clients, who were financial institutions. Apparently, it was because the inquiring firm was unable to secure a sponsor on its own. Members of this firm openly boasted about their close connections with governmental clients, and entities, especially in the intelligence field. Now, let's take a close look at the firm seeking a bank to sponsor its cards; while their purported qualifications of senior staff are detailed on the company's website, the names of the officers do not appear, making verification of specific work experience impossible. We do know who the CEO is, because he is the one who approached the compliance firm. A check of this individual's work history shows service at several Florida banks over the years, but also shows his role in a high profile while-collar criminal case against a union president, where the individual, who worked at this union's offices, appears to have received immunity from prosecution, and acted as a confidential informant. When this person's father relocated to South Florida decades ago, with his family, he Anglicized his family name, from the original Southern European one. This new last name happened to be the exact same as one of America's most prominent, and successful, leaders in the Federal intelligence community. Now, we see the son, since grown up, claiming to be the grandson, or nephew, of this famous intelligence officer, and using that purported relationship to insinuate himself into the confidence of potential clients, including financial institutions. This is not my conclusion; investigative journalists have made inquiries in the family's genealogy, supplemented it with interviews, and concluded that there is absolutely no family connection, between the famous government official, and the individual claiming to be his grandson; the entire story is fabricated, and a fraud. Thereafter, we see this individual offering his services, together with his " government connections," to financial institutions suffering under regulatory sanctions, with him promising to obtain a release of such sanctions. He presented documents purporting to show his association with law enforcement agencies, and government regulators, but there was no factual basis for the documents, and they appear to have been altered to include his name. You know where this is going, I am sure: notwithstanding the payments of six figure upfront fees, none of the banks obtains the promised relief, and his now former embarrassed bank clients lick their wounds in private. Even an American law enforcement agency was conned into advancing license fees for a prepaid credit card project that never materialized, and as a result, a Federal agent was forced to take early retirement, in disgrace. Yes, the compliance firm declined to work with the fraudster. Since the USA PATRIOT Act of 2001, we have seen a proliferation of companies in the AML/CFT compliance field, and some are indeed posers, totally unqualified to render services to the financial community, but when we see fraudsters, who take improper advantage of banks that are seeking to recover from sanctions and civil penalties, it is time to speak up. 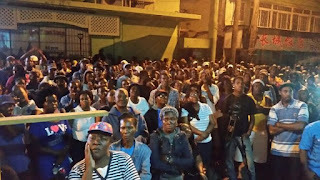 Haitians marched outside the US Embassy in Port-au-Prince, to protest the arrest, and removal of the former rebel leader, and current Senator-elect, Guy Philippe, to US District Court in Miami. The Indictment, which was originally filed in 2005, was sealed, until the defendant was taken into custody. (2) Conspiracy to Import Cocaine into the United States. (3) Engaging in Transactions derived from Unlawful Activity. The defendant could receive as much as a Life Sentence, and since the Sentencing reform Act of 1986, there is no Gain Time in a life sentence, meaning that he would die in Federal Prison. He is being held in Pretrial Detention, considered a flight risk, and because the Magistrate Judge determined that no combination of bail conditions would guarantee his appearance at trial. A number of Haitian media have noted that treaties in force, between the US and the Republic of Haiti, as well as Haitian law, prohibit the extradition of Haitian nationals, but Federal case law holds that the manner in which an individual is brought before the Court does not affect personal jurisdiction over the person. Trial has been set for the week of February 21, 2017. Swiss Authorities have advised that they have frozen $22m, in accounts owned or controlled by four Panamanian nationals in the bribe scandal involving Constructora Norberto Odebrecht SA. Though those individuals have not been named, they are believed to include former Panamanian President Ricardo Martinelli Linares, and his two sons, Ricardo Martinelli Linares, and Luis Enrique Martinelli Linares, whom the Swiss are seeking information upon, with Panama. It is not known whether Martinelli's daughter, Carolina Martinelli Linares, is the fourth account holder. Longtime readers of this blog will recall that we detailed a special trip that Martinelli took, to Lugano, in the Italian-speaking region of Switzerland, where he allegedly has extensive banking relationships, towards the end of his tenancy as president of Panama. The Attorney General of Panama has announced that Odebrecht has agreed to pay $59m, to settle corruption charges brought by the government, against it. This is the amount of bribes reportedly paid to Panamanians, to obtain lucrative construction contracts, granted by the Government of Panama.